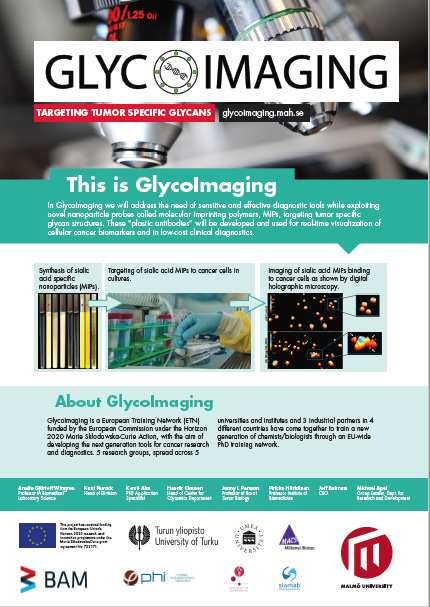 GlycoImaging is a European Training Network (ETN) funded by the European Commission under the Horizon 2020 Marie Skłodowska-Curie Action, with the aim of developing the next generation tools for cancer research and diagnostics. 5 research groups, spread across 5 universities and institutes and 3 industrial partners in 4 different countries have come together to train a new generation of chemists/biologists through an EU-wide PhD training network. GlycoImaging is collaborating with another ETN, coordinated by Malmö University.